This listing is a 2010-2019 Sportster Nightster Iron 48 Seat, P-Pad and all the mounting hardware that you need to mount the seat. This kit is completley bolt on! 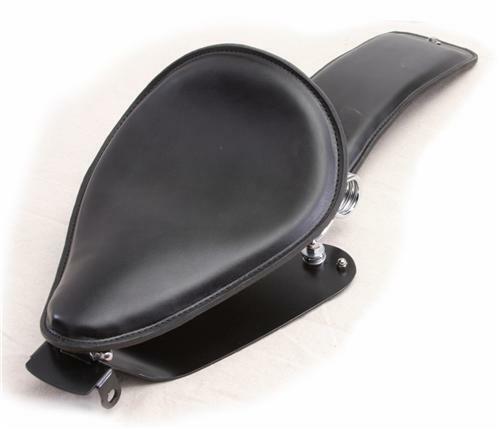 This is a Black Veg Tanned Leather seat and matching P-Pad is designed to bolt to the existing holes in the frame and fender a passanger pad and bolt to the holes in the fender. 2010-2019 Sportster Harley Nightster Iron Seat Mounting Kit. This p-pad can be made to match any seat that you would chose if you want a different seat. The pan is made of 1/8" inch thick steel. This makes it a very rigid and strong seat pan, that will be able to take a lot of abuse. The seat measures 10 1/2" wide by 13 1/2" long. The studs in the rear are spaced 7" apart. Custom sizes are available. I can offer custom sizing because I am the manufacture not an importer of these seats. The seat has a dense 1/2" layer of closed cell foam. The P-Pad 15"x 5" and is designed to bolt right on your 2001-2013 Sportster Nightster Iron 48 fender using the front fender mounting bolt and the rear fender screw on the fender. The nuts and screws to mount the p-pad come with the p-pad. You can call me at 314-972-4305 to ask questions, or to make a payment over the phone. I accept most major credit cards. If you don't need the seat mounting hardware kit, the seat and p-pad can be found by it self, in the store, if you want to buy this seat and p-pad with out the mounting kit. You can get more details about the mounting kit in the 2010-2011 Nightster Iron and Sportster catagory. Thank You for shopping at Mother Road Customs. We do not share your private information with third parties!